Voting Rights Act: Will the Supreme Court overturn it? 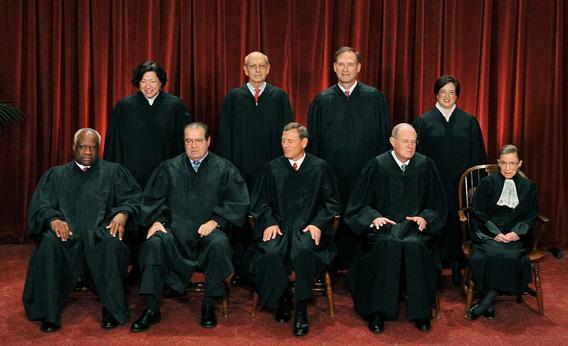 The justices of the U.S. Supreme Courtin 2010. Photo by Tim Sloan/AFP/Getty Images. We just re-elected our first African-American president. Pretty overwhelming proof that we don’t need a Voting Rights Act to protect against discrimination in voting, right? Wrong. In fact, it is because we have a Voting Rights Act that hundreds of thousands of voters were able to cast the votes necessary to re-elect President Obama. So it is disconcerting to realize that the Supreme Court accepted for review a case that many think will lead to the Voting Rights Act of 1965 getting struck down. Section 5 of the act in particular is in trouble. It requires a number of states, mostly in the South and all with a history of discrimination, to get permission from the federal government before changing their election procedures. As Columbia law professor Nathaniel Persily warns in the New York Times, we should begin preparing now for the likelihood that this landmark law will be struck down. This should be unthinkable, especially given all of the efforts to suppress voting rights over the past year. In June it was Pennsylvania state House Republican Leader Mike Turzai who boasted that the state’s new voter ID law would “allow Governor Romney to win the state of Pennsylvania.” He didn’t say this because there was any evidence of voter fraud in Pennsylvania. There isn’t. But the statute would have permitted hundreds of thousands of voters to be disenfranchised. This past weekend, it was Wisconsin state Sen. and Romney campaign co-chair Alberta Darling who suggested that Romney would have won Wisconsin if voter ID laws had been in place. Again there is no evidence of voter fraud. Fortunately, courts either delayed or banned enforcement of these statutes. And President Obama won both states by more than 200,000 votes. Turzai and Darling are two examples of Republican state legislators honest enough in their comments to make clear what underlies this massive effort to enact voter ID laws: Republicans believe that suppressing voting rights is a legitimate campaign strategy. We shouldn’t forget that more than 30 states have passed some form of a Voter ID law, and by the next election the number of states with strict photo ID laws will certainly increase. All to combat a problem that we know, and they know, doesn’t exist. That is why the Federal Voting Rights Act is so important. It is that statute that protected the right to vote, led to these unfortunate state laws being overturned, and made it possible to re-elect our first African-American president. Let’s hope the Supreme Court realizes this.